The Journal of Human Kinetics is an open access interdisciplinary periodical offering the latest research in the science of human movement studies. This comprehensive professional journal features articles and research notes encompassing such topic areas as: Kinesiology, Exercise Physiology and Nutrition, Sports Training as well as Behavioural Sciences in Sport, yet especially considering elite and competitive aspects of sport. The journal publishes original papers, invited reviews, short communications and letters to the Editors. Most importantly, manuscripts submitted to the journal must contain novel data on theoretical or experimental research or on practical applications in the field of sport sciences. 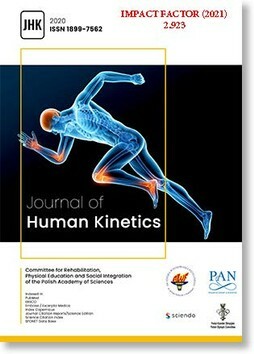 The Journal of Human Kinetics is published in March, June, September and December. We encourage scientists from around the world to submit their papers to our Journal. The English version of the website of the Journal of Human Kinetics, publishing JHK’s issues in English, management and collation of the database encompassing submitted manuscripts, collaborating reviewers and authors since the establishment of the Journal, along with implementation of the editorial manager and plagiarism detection software are financially supported within the 722/P-DUN/2016 agreement with the Ministry of Science and Higher Education providing sources for promulgating science and knowledge (2016-2017). The Editorial Committee of the Journal of Human Kinetics announces that the basic and fundamental version of our periodical is the electronic version available online.